Clinique (a manufacturer of skincare, cosmetics and fragrances) have come up with a very attractive GWP offer with its cosmetics line. 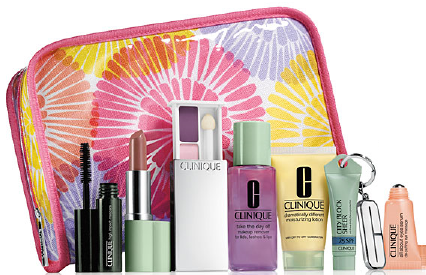 Whilst the contents are amazingly varied (you basically have your complete make-up set right there), Clinique is thinking of more than just offering its customers with a to-go make-up kit. This promotion aims to reach out to its existing customer base with an introduction of its cosmetics line giving samples for a trial run. By doing so, it increases the exposure of these products (which may be not so popular and well known) and heighten customers’ awareness towards them. Add a finishing touch with a beautiful case seen here, and you get women falling head over heels for the set. This promotion has created much buzz, resulting in a mad dash to get them before they run out of stock! They already did, so pretty sure they will repeat this kind of promo.